in a2 the magnets repel another. 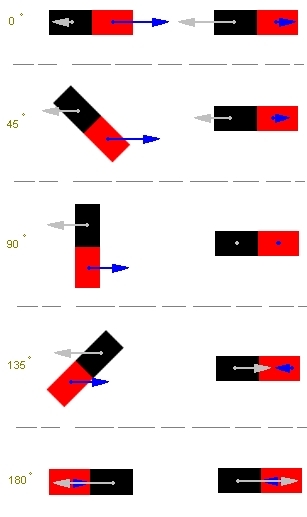 In a3 the magnets both repel and attract resulting in a rotational pull. The pull and the push are about the same size. Therefor the magnet at the left is almost infinitely more influenced by this interaction as the one at the right. In static situation a3 the curl of E(right) is zero. When the net force on an object is zero (i.e., no force acting on it) it remains in its state of uniform motion or rest. Thus, neither push nor pull means the primary wheel(s) are not influenced by load applied to the secondary wheel at this moment. The ratio of energy amplification here fully depends on the strength of the magnets. 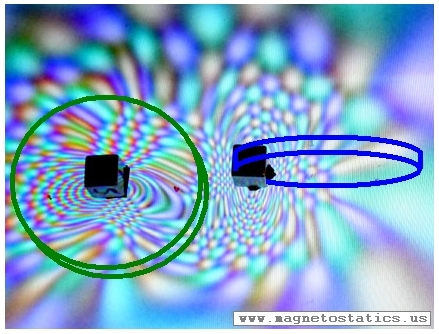 The field of the permanent magnet attached to the blue wheel at the right is UNEQUALLY disturbed relative to the field of the permanent magnet attached to the green wheel at the left. Thus the primary wheel can be moved passed this position quickly at much lower energy costs as the torque lead onto the secondary wheel. 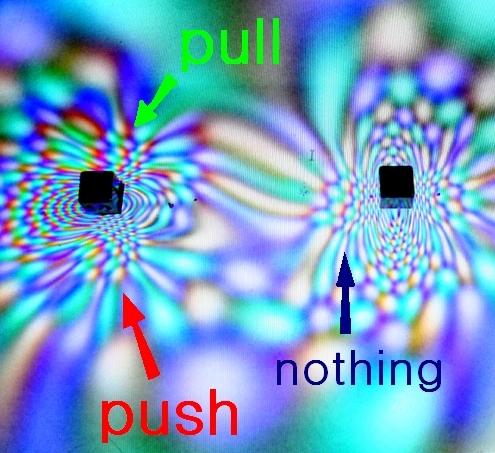 In this illustration you can clearly see how the field from the magnet at the left is disturbed much more as the one at the right. 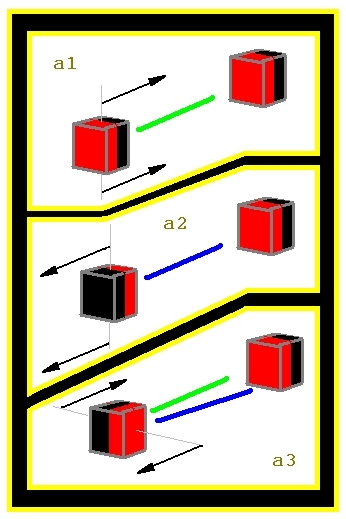 This means both magnets are subjected to different forces while interacting. You should now be able to appreciate the diagram below. "the combined forces of repulsion and attraction may 'add up' to zero". Physics has always known there could be a complex path towards a permanent magnet where the forces don't add up. I claim this is the answer to that question.